“A COAL KING GONE” announced the Los Angeles Herald on the morning of February 1, 1900. Alexander Dunsmuir, the 47-year-old multimillionaire, had died suddenly in New York while traveling with his wife, the former Mrs. Josephine Wallace. The couple had been married for nearly a dozen years at the time of his death, yet had reportedly kept their marriage secret until just a few weeks prior, as Alexander was worried his marriage might cause him to lose his share of his father’s estate, especially as his mother did not approve of Josephine. His father Robert Dunsmuir had been worth $15 million when he died in 1889, and the family spent their entire lives fighting over his wealth. The Herald noted, “Friends of Mr. Dunsmuir regarded his eastern trip as a belated honeymoon,” but Josephine’s daughter from her first marriage, Edna Wallace Hopper, a prominent stage actress, told the paper that they had actually traveled to see her in Chris and His Wonderful Lamp. Alexander built Dunsmuir House in 1899 as a gift to Josephine, but didn’t live long enough to share the mansion with her. At his death, his widow was willed the house but little else; Alexander’s brother James received the bulk of his estate. Knowing that Josephine could very well contest the will and win, he offered her $25,000 to keep the issue out of the courts. She agreed, likely because she was already quite ill. In 1901, Josephine died in Dunmuir House after a short battle with cancer. Her daughter Edna would repeatedly sue the estate and lose for the next few decades, and would later reinvent herself as “The Eternal Flapper,” not the only woman to be so labeled — Fanny Ward is arguably better known by that nickname — and not always in a flattering way. A Daily Mail article of 1927 satirized the supposed inability to tell the difference between flappers at 25 years of age or at 60. In the 1920s, Edna had a full facelift, allegedly agreeing to being filmed during the procedure, and toured the country giving advice and selling cosmetics promoting a youthful appearance. Her true age is disputed, however, and it’s highly likely she wasn’t even close to the 60-something woman she claimed to be, and was lying about her age to make her appearance seem more astonishing than it actually was. The house by then was long out of the Dunsmuir family, having been sold to Isaias W. Hellman in 1906. 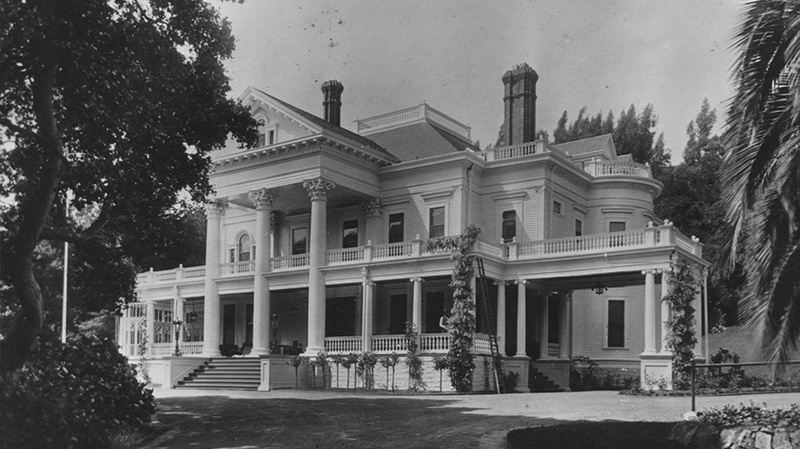 The Hellman family lived in the mansion until the 1960s, at which time the house was sold to the City of Oakland, California, who planned on using the home and grounds as a conference center. Instead, they did nothing with the property, and in the early 1970s a non-profit formed to restore the home and place it on the National Register of Historic Places in May, 1972. This non-profit is in charge of tours of the home, as well as renting it out to events and for filming locations. Burnt Offerings (1976) was the first film shot at Dunsmuir House, though it’s arguably more recognizable as the house in Phantasm (1979). The finale of the horror spoof So I Married an Axe Murderer (1992) also takes place at Dunsmuir House. This article is an update of a snippet originally posted in 2009. Previous Post It’s Halloween on SBBN!